Today's review is the latest in the ever-expanding line of single shop release sticks from Pete Johnson (@tatuajecigars on twitter), owner of Tatuaje cigars. Pete has been taking some heat online recently about the amount of "limited release" sticks he has been putting out, but my feeling is "the more the merrier." 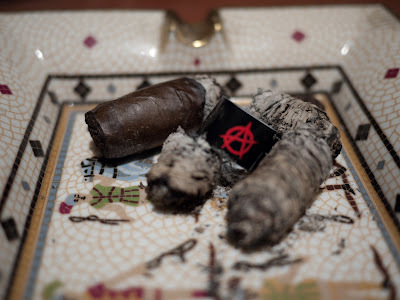 The Tatuaje Anarchy was made exclusively for Smoke Inn Cigars in Palm Beach Gardens, Florida. Abe Dababneh (@tatuajeanarchy on twitter) was kind enough to send me a sample of this stick to review before they are released to the market. Included in the package was a letter from Abe explaining more details of the cigar, which I have included with this review below. You and your site have been chosen to be amongst the first in the country to sample the new Limited Edition Tatuaje Anarchy. Back in the spring of 2009, I approached my good friend Pete Johnson regarding the idea. Pete was immediately on board. After about 6 different attempts, we felt Pete & Pepin struck gold with a blend that we were proud of. The wrapper used is a very special proprietary crop of Ecuadorian Habano leaf that Pepin & Pete personally chose for the project. The binder and filler is Nicaraguan, and blended to perfection. 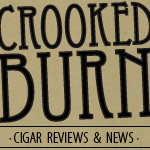 This is a something we are very proud of and hope you enjoy the smokes. You are one of a very select few of the bloggers we felt would appreciate and be worthy if this package. The National Release Party will be held December 10th at our West Palm Beach location with both Pete Johnson & Pepin Garcia in attendance. Pre-orders will be taken at our website, beginning midnight Black Friday, November 26th. Boxes are 15 count with a retail price of $149.85 per box. All orders will be guaranteed to ship beginning Dec. 13th, just in time for the holidays. If you have any questions or concerns, please do not hesitate to contact me personally. Thanks Abe for the kind words and personal letter. I appreciate the opportunity to do this review. Now that we all know when and where to get them, let's see if the Anarchy is worth digging into your holiday funds for...and on to the review. 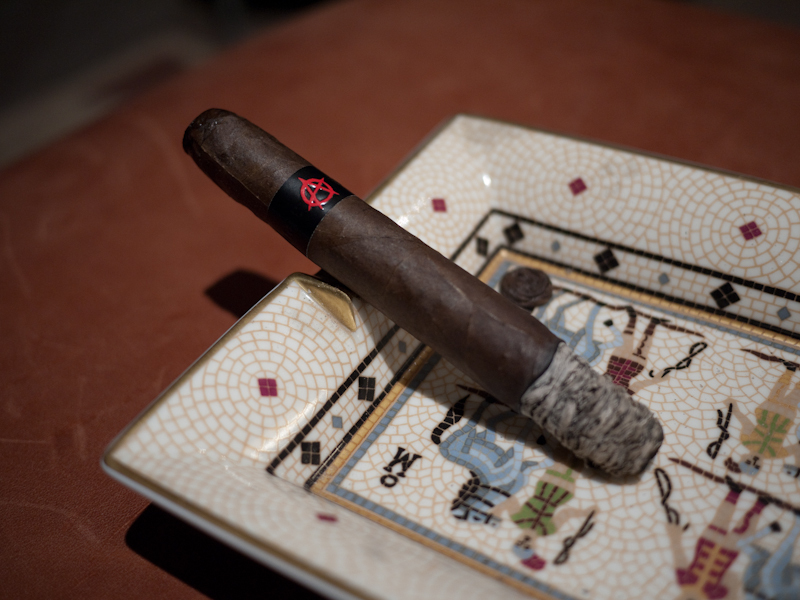 The first thing that stood out when looking at my Tatuaje Anarchy was the elaborate pigtail on the cap of this stick. I've read others describe it as looking like a rolled pastry and I don't think there is any other way to describe it. Along with its tapered shape, there is no mistaking this cigar for another -- even if it were unbanded. The darkish brown wrapper is very oily and had medium-sized veins. The pre-lit aroma consisted of some sweet scents mixed with some stronger hay notes. The cold draw was a little tight for my liking and tasted sweet with hints of cocoa. I'm sure the tightness on the draw was due to just how packed this stick was. Squeezing the cigar, it had almost no give to it. I lit my Tatuaje Anarchy with a single torch and the first few puffs were full of a sweet spice that coated the top of my palate and the back of my tongue. The spice was not the typical Nicaraguan peppery zing, but more of a warm cinnamon. The stick was drawing a medium amount of smoke, but giving off tons while resting. About a half inch into the stick, the flavors started to mellow and the smoke got very sweet. On the front, I got mostly muted nut flavors and on the finish, just some sugary sweetness. The flavors were there but it was really mild, nothing like the fist few puffs. The burn had no problems and the body sat in the medium range. 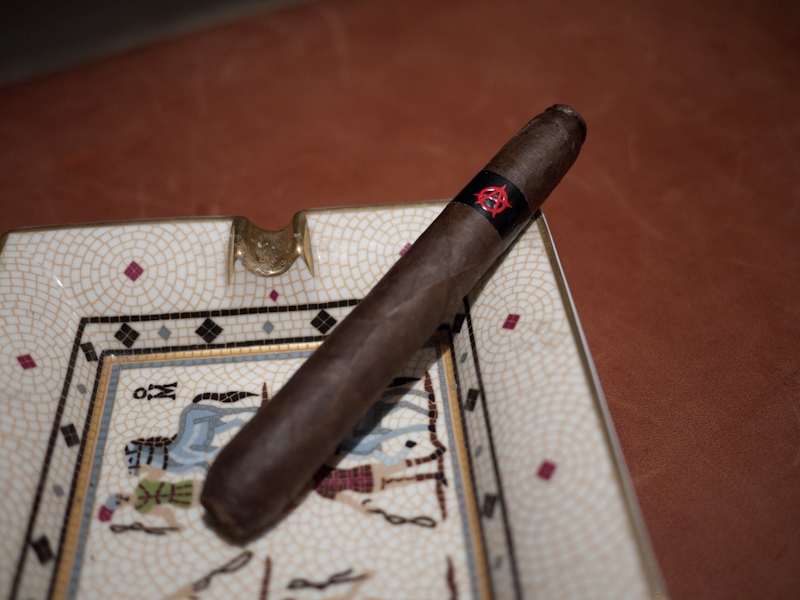 The second third of my Tatuaje Anarchy is where the stick took a different direction and really took off. The muted flavors I got in the first third were now gone and, again, I was getting a lot of strong cinnamon spice mixed with what I would call toasted marshmallow or burnt sugar. The flavors on the finish were now strong, too, and were a mix of more sugar and some hints black coffee. This part of the cigar was excellent and a treat to smoke. The body in the second third also started to ramp up and I would call it more in the full range. The start of the final third wasn't what I had expected, as it went back to what I was getting mostly in the first third. The stick went quickly from that really strong, in-your-face flavor of the second third, back to the muted profile of the sweet flavors both on the front and the finish. I was a little disappointed until I burned to about an inch and a half left of the cigar, where it took yet another turn. It was like going to a different cigar with those last puffs as I then got the really strong, traditional Pepin black pepper flavor that I love. I actually looked at my smoking partner and said, "Wow, what happened?" I could see that the color of the ash had changed too, into a really dark, almost black color. The body was now well into the full range and I was happy that I had eaten a big pasta dinner to counteract some of this power. The burn was perfect all the way to the end and never required any kind of touch up with my lighter. My final thoughts on the Tatuaje Anarchy ? This is a complex cigar blend that when it is on, it's really on. And when it's not, the flavors are a little muted. In this single experience with the stick, the flavors just seemed to be all over the place at different times. Maybe Anarchy is a fitting name? I think with age and some more mixing of the flavors in the different tobaccos, it could turn into something that is great from start to finish. Smoking this cigar was very interesting and I don't think I've ever written so many notes in my review book. It should be noted, again, that at the end of this cigar it was VERY strong. Make sure you plan accordingly. Would I buy it again? The price is right (if not cheap) for a cigar this size coming from Pete Johnson. I would buy more and let them rest in my humi for awhile and revisit them in a few months. Would I buy a box? I'm not sure I'd jump on a box of these right away, but if you don't, there might not be any left to have. I'll be looking to do a split with some other BOTLs. I want to say thanks again to Abe from Smoke Inn for including me in his list of people he sent samples to. It's my favorite thing to smoke new cigars and to get one from one of my top favorite brands, I couldn't be more grateful. I have got to say that I really appreciate your honesty. I am getting more and more skeptical with all of these limited or exclusive releases as of late. The seem to be coming out in droves. Don't get me wrong Tatuaje are some of the best cigars I smoke and best available in the marketplace. I am not sure if I will venture to find these or not. They do look wicked, but maybe I will work on a small trade for a few... We'll see. Thanks for your reviews! Good work! Thanks for reading Tadd, and thanks for your kind words.